So you've purchased your Joseph's Grainery Whole Grains, what do you do with them now? Well, there are all sorts of great recipes on this blog for you to try with your whole grains and lentils from Joseph's Grainery, but you probably won't be using all of your grains at one time, so you'll need to know how to properly store them so they will last the longest and be ready when it's time for you to use them. Prepare for it's arrival - You've ordered your whole grains, you know they are coming, so make sure you have clean, sealable containers ready for it's arrival. All of our grains are shipped in resealable plastic bags or small kraft bags, but we reccomend that you store the grain filled bags in another sealable container. This just ensures that pests can't get into them. Weevils and moths can bite a hole though paper or cloth, so make sure your storage containers are plastic or glass. If you are storing larger quantities of grains, a new plastic garbage can makes an economical storage option. Just make sure to line the container with a plastic liner prior to filling it with the wheat, barley or lentils. Tie the top of the bag off and put the lid on the can. Another great option are the storage bins by Rubbermaid and other manufacturers that you can find at any hardware or home supply store for $4-6. This is how we prefer to store our grains at our home. 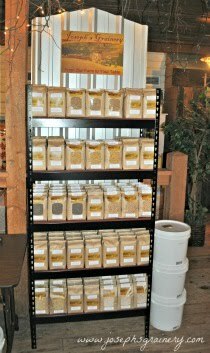 We keep our totes/bins in our pantry and fill them with the 3 and 5 pound bags of Joseph's Grainery Whole Grains. Labels: how to, storing whole grains, what do I do now?